Asian stock markets have risen, joining a global rally, after European Central Bank’s president, Mario Draghi, unveiled a plan targeted at easing the region’s debt crisis. The ECB said it would buy bonds of the bloc’s debt-ridden nations in a bid to bring down their borrowing costs. The implied borrowing costs for Spain and Italy fell after the announcement. 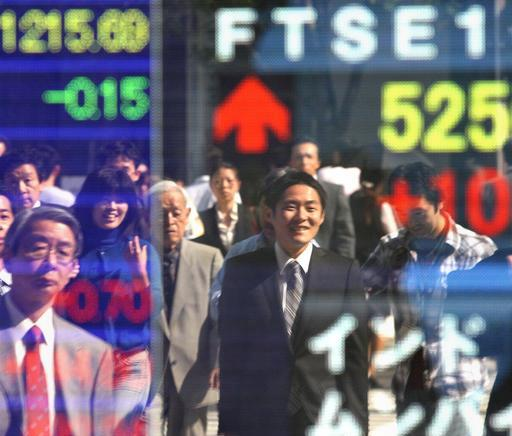 Japan’s Nikkei 225 index rose 2.2%, Korea’s Kospi gained 2.6% and Hong Kong’s Hang Seng added 2.4%. “We think this is a credible plan to addressing the issue, and while there are still political hurdles, we expect those will be addressed,” said Alec Young, global equity strategist at S&P Equity Research. The borrowing costs for some of the eurozone’s larger economies, such as Spain and Italy, had risen to levels considered unsustainable earlier this year. That led to concerns that these nations would no longer be able to borrow money from international investors and, therefore, would not be able to repay their debts, further escalating the region’s debt crisis. Many investors feared such developments would not only hurt the eurozone’s growth, but could also derail the global economic recovery. That would have had a knock-on effect on Asia’s export-dependent economies, which rely heavily on global demand. However, the ECB’s announcement, and the drop in borrowing costs of Spain and Italy thereafter, has helped allay those fears. Markets in the US rose, with the Dow Jones index hitting it highest level in almost five years. In Europe, Germany’s Dax index closed 2.9% higher, while France’s Cac 40 jumped 3% and the UK’s FTSE 100 rose 2.1%. “The markets were looking for a strong decisive action and a commitment from the central bank that they are ready to act if any issues blow up in the region’s bigger economies,” said Justin Harper of IG Markets. The ECB announcement also provided a boost to the euro currency, which rose against the US dollar and the Japanese yen. The euro was trading at $1.263 in Asian trading. It also rallied against the Japanese currency to 99.63 yen. Analysts said that the ECB’s plan had boosted investor morale and that they were more confident of investing in riskier assets. “The ECB’s actions afford time, allowing risk appetite to stage a comeback, for now,” said Vincent Chaigneau, a strategist at Societe Generale. However, they warned that while the ECB’s plan had helped allay market fears, the crisis was far from over. “Mr. Draghi has won a battle, but cannot win the euro area crisis war by himself,” Vincent Chaigneau said.